That happened to me in res too. I came to the conclusion that our res's are behind a firewall or something. subspace would work fine after 2am, and whenever a large amount of people were out of res (ie: exam periods). 4. How much pr0n do you look at? When you go to pr0n sites they generally install spyware/adware/malware on your computer without your knowing. These programs do a number of things including using your internet connection without your knowledge. Kthx> yes it is, newbie. 24 is in for Freq 1 as a Warbird. help: (renzi) (Public 33): is it possible for a washing machine to cause a wireless connection to lag? This trace was started on 20-Feb-2009 21:22:13. The host '66.36.241.110' (known as sls-cb9p7.dca2.superb.net) has been found, and is reachable in 12 hops. The TTL value of packets received from it is 116.In general this route offers a good throughput, with hops responding on average within 96ms. However, all hops after hop 9 in network 'HopOne Internet Corporation HOPONE-DCA2-1' respond slightly slower than average. Someone on my squad chat said by blocking certain IPs the traffic will reroute, using differENT routes to get to the TW server? Nothing running except windows shell, checked that in ctrl alt del process list to make sure. while playing (reason I can't dd). Hopone will not return ICMP packets so it appears as if 100% or close to it packetloss results from those hops. In-game your trace is actually 17-18 hops in total not 12. The last 3 hops didn't return anything but you have a lot of lag time starting with 195.182.179.x and 213.161.65.x (virginmedia.net and above.net, 3-4 hops beyond your modem/computer), beyond that pretty much none. It seems like local network congestion before reaching the US. If it persists contact your ISP if it begins to effect other network applications/games. Sent an email to my ISP telling them about this, but I doubt there's much they will (or can) do? They're a huge ISP so I find it doubtful they'll take actions for one customer, but I'll phone them anyway if I'm not satisfied with the email, then if that fails I guess I'll seriously consider changing to another provider. 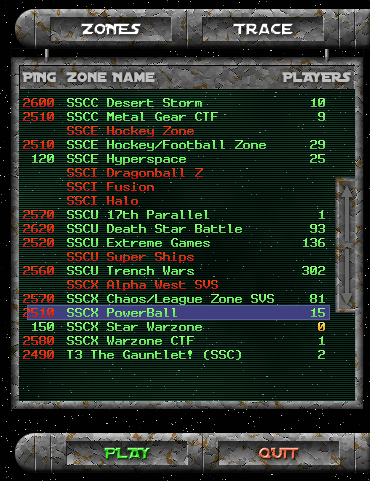 I can't even enter the zone most of the time now (just get disconnected before entering pub) or play at all and the S2C is ridiculously high. I'm not sure if this is computer/OS related, or internet related. I got a new laptop a few days ago with windows 7, and I lag harder now than I did with my xp machine. Currently this is my lag. PING Current:280 ms Average:1880 ms Low:240 ms High:14070 ms S2C: 3.9% C2S: 0.0% Yes I'm on dialup, no I can't get a better internet. I'm moving in a week or 2, so it's pointless. I highly doubt it's spyware, or a virus. I haven't downloaded anything other than SS. So.. Is my lag computer/OS related, or internet related? Very informative thread about cameras and hard drives. Last edited by alijoseph; 11-09-2017, 09:47 AM. Hey guys I just joined the forum today. I submitted my traceroutes for the lag today also and I've posed them at the bottom of this post too...Please bring back SubSpace in a huge way and bring back Virgin Interactive and Burst Studios and have them develop and publish SubSpace again. Please add SubSpace to the Microsoft Store aka the Microsoft Windows Online Store. Also please bring back SubSpace to Windows, Mac, ioS, Android, Nintendo Switch and 3DS. Please remaster this great classic and also add touchscreen controls for mobile tablets and phones. Make SubSpace 2 someday, with 2.5D graphics. Also please update the client to always remember the users resolution settings, I always have to set my resolution every time I re-enter the game. Also please bring back the old classic zones I guess they are referred to as Alpha Zones. This is the most overlooked video game of all time, please have more people know about this game and bring SubSpace back to life in a huge way. Thanks all. My screen names are Ultima X Odyssey and SubSpace 2...below are my traceroutes.